Create your individual room structure. 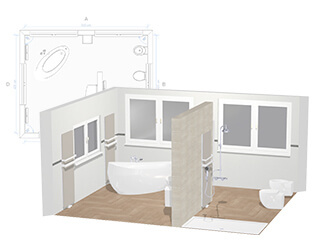 Insert windows, doors and connections..
Use our predefined standard room shapes to create a clear floor plan with the dimensions of your bathroom. If your bathroom does not match any of the predefined standard room shapes, select "FREELY-DEFINED SPACE" to create your own tailored measurements. To incorporate sloping ceilings in your bathroom plan, click on the roof icon shown on the wall in question. To ensure your plan corresponds to the actual situation, in the second step, you can easily add your windows and doors as well as connections. 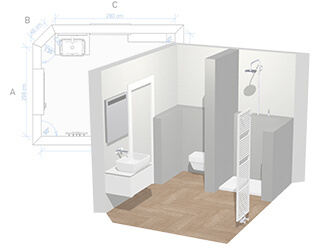 The 3D Bathroom Planner then takes account of these factors during the planning process, leaving you free to concentrate on designing your bathroom with no unpleasant surprises at the implementation stage. Select outstanding Villeroy & Boch products from the different collections and position them in your chosen locations in the floor plan. The Bathroom Planner will notify you immediately if structural requirements make any of these chosen positions impossible. Different views and angles allow you to coordinate the individual products with maximum precision and consult your designs at any time in a clear 3D view. 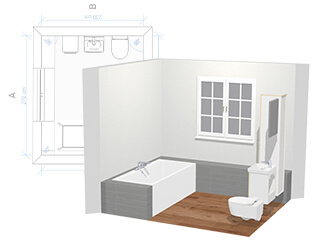 When you have finished planning your bathroom, you can send off a PDF copy of your design together with all your important product information and other planning options. 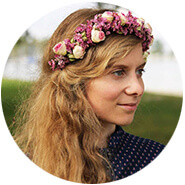 Simply type your first name, last name and email address in the appropriate fields and you will very soon have all the information you need to turn your dream bathroom into reality. 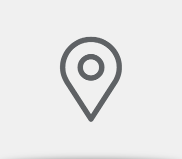 To find a dealer near you, simply type your telephone number in the appropriate field and select a dealer of your choice from the list. The dealer will then contact you to provide professional advice and support with the next steps in your bathroom planning process. Discover designs created by selected bathroom experts now. 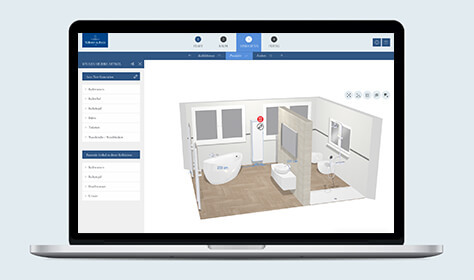 Open the planning templates with a single click and then quickly and easily adapt the bathroom to suit your individual wishes and needs in our free 3D Bathroom Planner. 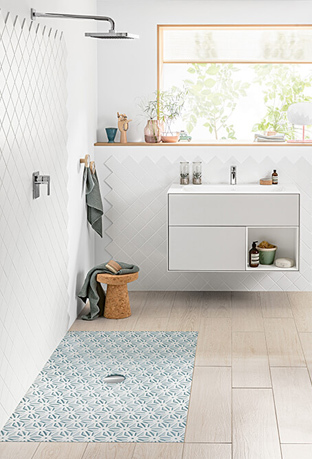 Villeroy & Boch’s innovative products help you transform your bathroom into a tasteful well-being oasis. A flush-fitting corner shower with a rain shower head, for example, paves the way for uniquely relaxing wellness moments. 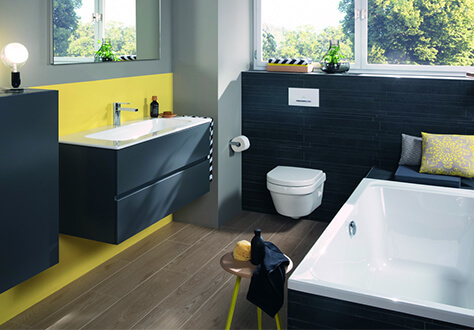 A slimline washbasin together with a compact toilet and a space-saving vanity unit will combine comfort with freedom of movement in a small space. When it comes to planning a small bathroom, you still want all the comfort of a fully fitted bathroom - and a bath is an important part of this. 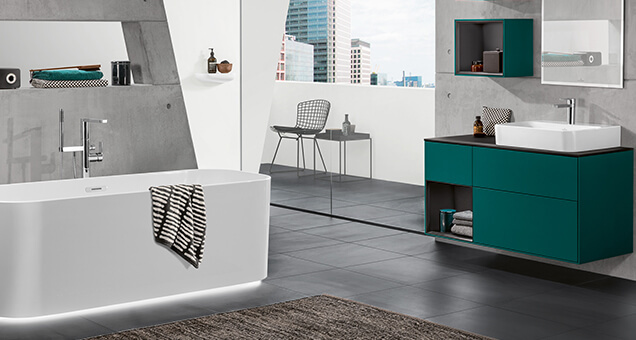 Thanks to Villeroy & Boch's space-saving baths, you can enjoy maximum comfort even in small rooms. They also leave enough space for other essential items, such as a washbasin, toilet, cabinets, towel holder and heating. When it comes to planning your very own spa bathroom, you can give free rein to your creativity. Find inspiration with gently bubbling indoor hot tubs, flush-fitting wellness showers with rain shower heads, elegant washbasins and high-quality taps and fittings, as well as tasteful accessories to create the bathroom of your dreams step by step. The planning of a guest bathroom is a challenge, especially because of its generally smaller size. In order to make the most of the available space, you could opt for a practical compact toilet or a narrow washbasin. Your fully equipped guest bathroom can be completed by a space-saving walk-in shower. A tastefully designed bathroom is a well-being oasis in your own home - a haven of peace where you can relax and recharge your batteries. Enjoy this enhanced living quality in your own home, whether as part of a new construction or a renovation project. The online Bathroom Planner allows you to plan your bathroom online according to your wishes and requirements in just a few steps. Would you like to plan your very own dream bathroom together with one of our authorised dealers? 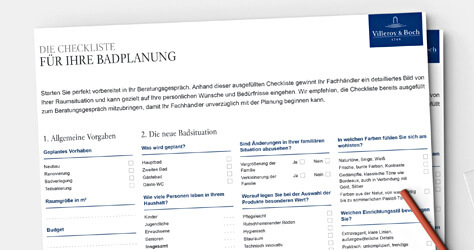 To make sure you are fully prepared for your consultation, we recommend that you fill out our checklist to record the most important details of your spatial configuration as well as your personal preferences and visions. The individual points also provide another opportunity to reflect on which criteria are particularly important in the design of your new bathroom. 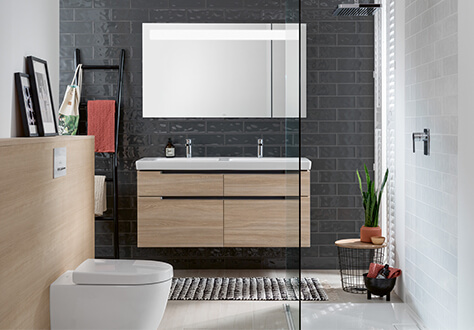 You need to consider some important aspects and clarify a few general specifications before you start planning your bathroom to make sure that your bathroom meets both your visual and functional requirements. Every bathroom has special structural features, which you need to take into account once you start planning the details. If inlet pipes for water and waste water already exist, then that will often limit where you can position the washbasin, bath and shower. 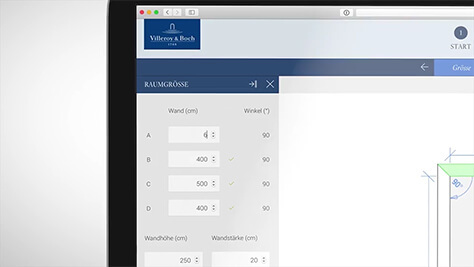 Consult a Villeroy & Boch dealer during the planning process to clarify how many connections and what expansion work may be necessary. Sloping ceilings can also lead to restrictions, which will significantly impact the design of the bathroom. When renovating your bathroom, you should also make sure that the products you choose will fit through the door afterwards. Your very own dream bathroom needs ample space for you to move about in to make you feel completely at ease. If you have a small bathroom, try not to overload the room. A minimum distance of 120 x 120 cm between the sanitary objects is ideal. If you choose a walk-in shower without a door, then you should also make it large enough to avoid water spraying. Half-height partitions, which separate the toilet from the rest of the bathroom, are becoming more and more popular as an interior design element. You may have to plan additional space for it, too. What do I want in my bathroom? Your very own small spa bathroom should be tailored to your needs and preferences as best as possible. So before you start planning, think about which fittings are important to you. Do you want both a bath and a shower or would either do? Apart from the toilet, would you also like to fit a bidet or urinal? Which electrical appliances do you want to use in your bathroom? If you also want to have a washing machine and a tumble dryer in the bathroom, then make sure that there are enough water connections and wall sockets. A harmonious lighting concept also needs an adequate power supply. Your dream bathroom should be a harmonious combination of stylish design and practical usability. For this reason, we have put together a few tips and tricks below that you need to consider while planning your bathroom. How many people are going to use the bathroom? A family bathroom has different demands than a guest bathroom. Therefore, think about how many people are going to use the bathroom now and in the future. For example, a double washbasin is the perfect solution when two family members want to brush their teeth in the morning at the same time. If you have children, then low-maintenance materials would be an advantage. Tiles are significantly easier and quicker to clean than wall panelling with wood or wallpaper. The Villeroy & Boch CeramicPlus finish also makes it easier to clean ceramic surfaces. When you choose your bathroom furniture, you should also consider how much storage space you need. Are you planning an accessible bathroom? Accessibility is also an important factor when redesigning or renovating a bathroom. To maximise comfort and convenience, make sure there is enough space to enable easy access to all relevant objects. An accessible bathroom includes key elements such as a barrier-free bathroom door and a walk-in shower. You should also pay attention to customisable installation heights and the additional functionalities of each fitting. Incorporate any practical complementary products you may need, such as a grab bar in the bath or a shower seat. Redesigning your bathroom is the perfect opportunity for you to completely change its style. So before you start planning, take some time to think about which design best suits your needs and preferences. Should it be timeless and classic or extravagant and luxurious? Would you prefer a country or a metropolitan style? 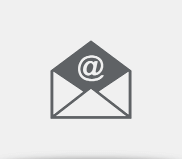 Are clear lines important to you or would you rather have curved shapes? Take a look at our inspiration pages for a few ideas and use our online bathroom planner to see how each element affects your room layout. When selecting furniture, you should also look at the practicality of each item and not just its design. Include plenty of cabinets, shelf space and shelves to store and organise all of your toiletries. If the bathroom is not very large, then tall cabinets and vanity units are an excellent choice. These practical pieces of furniture are space-saving sensations and take up very little room themselves. Moreover, large washbasins are extremely convenient for everyday use. Combine various light sources for effective lighting in your dream bathroom. Adjustable recessed spotlights, for example, can be used for a basic level of brightness as well as to showcase selected objects. 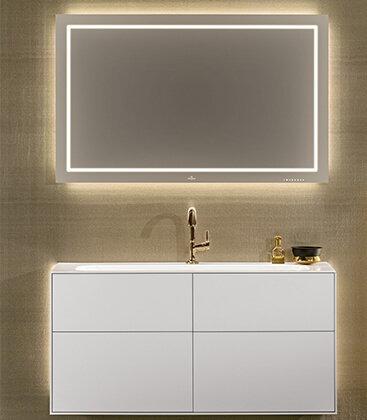 Mirror lighting provides the brightness you need for your daily grooming and pampering ritual. Consider the different impact of cold and warm light when choosing your lighting. Coloured light creates a harmonious effect. Blue, for example, is relaxing whereas orange light radiates a cosy warmth. Find inspiration with our design ideas and explore completely new horizons for transforming your bathroom into a real well-being oasis. The amazing diversity of shapes, colours and materials opens up a multi-faceted spectrum of possibilities. Light is an effective design feature that allows you to very deliberately influence the atmosphere in a room. To transform your bathroom into a haven of peace and relaxation, it is important to consider this essential aspect. Be impressed by our bathroom inspirations and create your very own feel-good oasis. Discover the wide range of colours, shapes, materials and accessories. The Subway 2.0 collection impresses with its powerful purity and wide variety of models. With their clearly defined shapes and precise lines, the individual products convey an unparalleled sense of harmony and classic modernity. The Finion collection brings you aesthetics in their most luxurious incarnation. The puristic design and precisely crafted materials create premium products that radiate personality and absolute quality of living. The Architectura system collection meets the most demanding standards in terms of design and comfort. The ultra-flat rimless shower trays are particularly impressive and an ideal choice for any contemporary-modern bathroom design. Venticello represents a perfect symbiosis of top-class design and clever functionality. Both the ceramic products and bathroom furniture impress with their seemingly weightless beauty as well as high practical benefits. 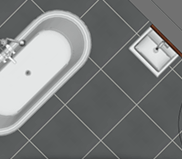 How can I create a custom room shape in the online Bathroom Planner? To create a custom room shape, you first need to select “Free-form” from the room shapes under the “Start” tab. A grid will appear where you can draw in the outline of your bathroom. 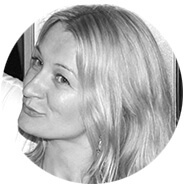 Click on the starting point and use drag & drop to draw the line in the desired direction. As soon as you let go of the line, a wall will be drawn. Repeat this process until you get back to the starting point. How can I adjust the size of my bathroom in the Bathroom Planner? 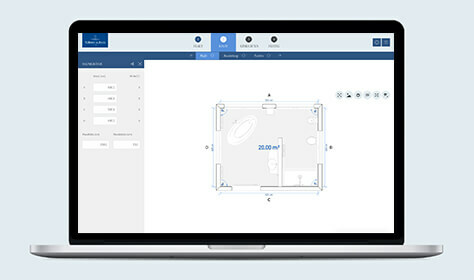 The second step, “Room”, lets you adjust the size of the bathroom under “Dimensions”. You will see a floor plan of your bathroom here. Click on a wall and use drag & drop to move it. Alternatively, you can enter the exact length of each wall and the wall height in the menu on the left. You can even adjust the size of your bathroom after you have placed products in the room – they remain saved after the room size has been changed. How can I insert windows, doors and other room elements into my bathroom? You can add room elements to your bathroom in the second step, “Room”, under “Fittings”. 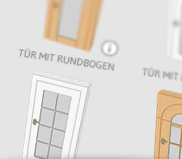 Simply click on a category in the menu on the left and select a room element. You can then drag & drop it to the desired position in your bathroom. You can also move elements already in position by dragging and dropping them. How can I insert a pre-wall into my bathroom? After you have defined the room shape, you can add various pre-walls to your bathroom in the second step, “Room”, under “Fittings”. Simply click on “Walls” in the menu on the left and select one of the pre-walls. Drag & drop it to one of the existing walls in your bathroom. You can select and move a pre-wall already in position at any time. How can I change the colour/tiles of the floor or walls in my bathroom? You can design floors, walls and other elements in your bathroom with different colours and tiles. 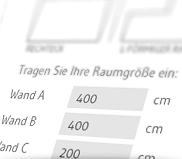 Select the desired room element under “Colours” in the menu on the left in the second step, “Room”. Alternatively, you can simply select the relevant element in the room. 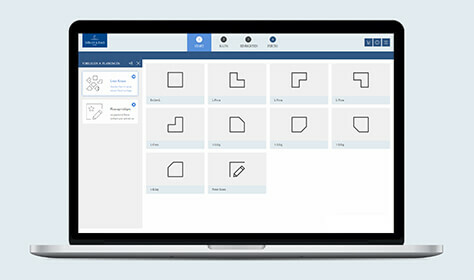 You can now choose the colour or Villeroy & Boch tile by clicking on the default colour once. 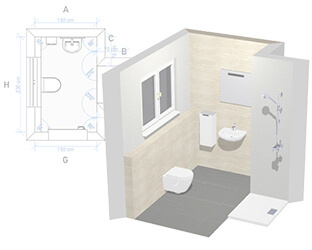 How can I save my bathroom plan and then complete it later? You can save your bathroom plan at any time and continue at a later date by clicking on “Finalise your plan” in the fourth step, “Finished”. 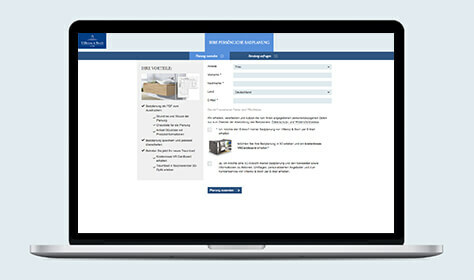 After filling in the contact form, you will be sent a link of your customised plan as well as a PDF file with the floor plan, 3D view and list of items. Your plan is now permanently saved and you can retrieve and edit it at any time. 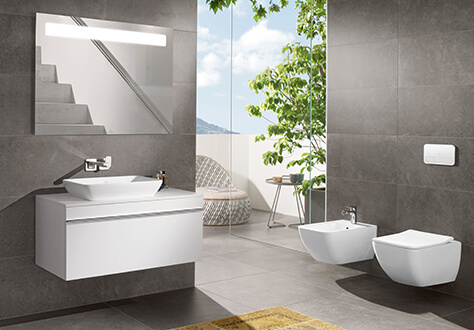 Villeroy & Boch stands for the perfect combination of functionality, comfort and design. 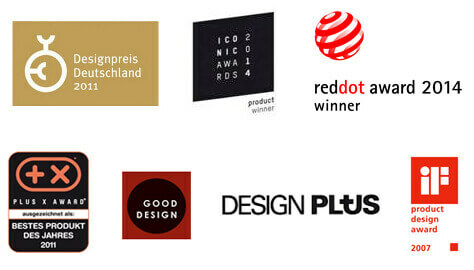 Hardly surprising that numerous collections and products from Villeroy & Boch have been awarded design prizes.